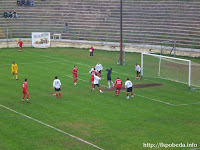 The 52nd duel between Pobeda and Vardar was played this round. Couple of interesting facts came out before this derby. 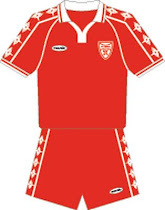 One of the facts is that Pobeda's captain today was the 37-years-old veteran Darko Krsteski who was also part of the match between Pobeda and Vardar played on 23/08/1992 in the first round of the first season of the Macedonian league from the independence of Macedonia. 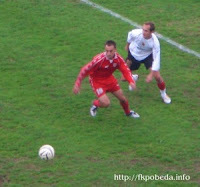 The other interesting fact is that the football federation of Macedonia named Zoran Petkovski as referee on this match, a well known former member and regular player of Pobeda. 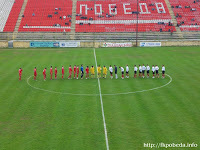 The match started with a minute silence for a former player and trainer of Pobeda, Ilija Dimoski who died last week. Only five minutes passed and the intense atmosphere and the big motivation on both sides gave the first result - one broken nose. 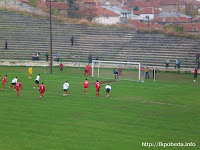 Lazar Stanisic was the victim and in the next ten minutes Vardar played with a player less, until Milko Gjurovski decided to throw the 16-years-old Dino Najdoski in to fire and didn't make a mistake, as the young defender is real successor of his father, the legendary Macedonian defender and former player of Pobeda Ilija Najdoski. Vardar had more of the ball possession in the first half and it resulted with the first big chance in the 14th minute. Milisavlevic sent great pass to Emrulahu who came alone close to the goalkeeper, but Aleks Vrteski blocked his shot. In the 37th minute the same situation was repeated. This time Emurlahu sent a stronger shot, but the goalkeeper Vrteski again blocked the shot. The guests continued with the small pressure in the second half and after one foul by Krsteski over Bajevski, the referee whistled for a penalty in the 49th minute. Aleksandar Bajevski decided to take the penalty kick and he was successful, but the referee decided to disallow the goal because of the players who entered the box before the kick was taken. And in the second attempt, the goalkeeper Vrteski was more successful and saved the kick. 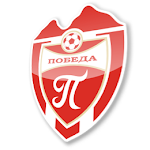 Pobeda had their biggest chance for scoring in the 78th minute. Nastoski came very close to the goal from the left side, but his shot was blocked by a defender. In the last part of the match both sides pulled back and mostly fighted in the middle of the pitch. At the end, Pobeda and Vardar shared the points and this outcome was probably the most realistic outcome after the today's show.